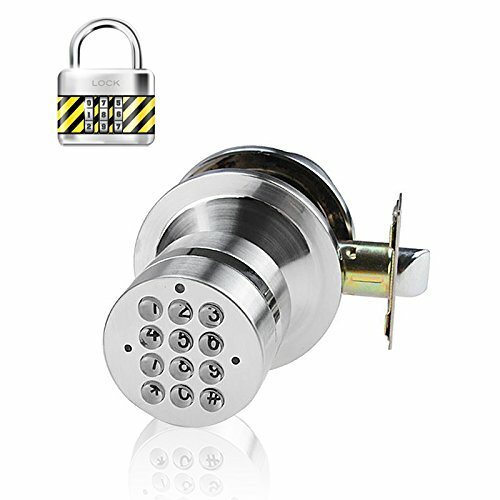 Battery Operated Door Lock ensures nobody uninvited in getting in as it is made of Silver Zinc Metal Alloy and has an Anti Spy Code Encryption and 15000 Hours Battery Usage Time. This security door lock series consists of standalone digital keypads designed to control access of a single entry point for facilities. It is a door handle so when the code unlocked the lock you can open the door by turning the handle. There are up to 10 changeable codes including passage, user and master levels. Keypad entry ranges from numbers 0 to 9 plus the keypad has a backlight for use in low light. Suitable for indoor and outdoor, this door lock has no external wiring and operates with a battery that offers up to 15000 hours of life plus there is a low battery warning with emergency power jump override. This electronic door lock has anti spy code encryption so making even more secured. Install this on your office, store room or just a place that you want more privacy as well as not needing to have keys to open the door, just a good memory for the password. This product is in stock now, we guarantee next working day shipping and offer a 12 months warranty on all our products. Brought to you by the leader in electronic devices and wholesale security gadgets, Us.